Jeff Bezos, chief executive of Amazon.com, has accused the owner of the National Enquirer of trying to blackmail him with the threat of publishing "intimate photos" he allegedly sent to his girlfriend, unless he said in public that the supermarket tabloid's reporting on him was not politically motivated. The accusation, published in a blog post, is the latest twist in a weeks-long saga that has brought the world's richest person's private life into the spotlight and thrusts him deeper into a battle with the US tabloid publisher, which has had close links with the president of the United States. 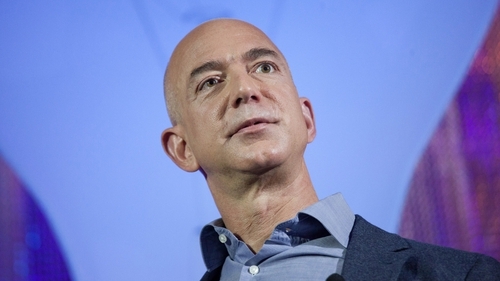 "Of course I don’t want personal photos published, but I also won’t participate in their well-known practice of blackmail, political favors, political attacks, and corruption," Mr Bezos wrote. That same day, the National Enquirer touted it was publishing alleged intimate text messages between Mr Bezos and Lauren Sanchez, a former television anchor whom he was said to be dating. Shortly after that, Mr Bezos opened an investigation into the leak led by Gavin de Becker, a longtime security consultant and former appointee of US President Ronald Reagan. Mr De Becker proceeded to tell media that the leak was politically motivated. Mr Bezos, Amazon and the newspaper he owns privately, the Washington Post, have all been targets of attacks on Twitter by US President Donald Trump. The Washington Post has published many articles critical of the president. It acts as Amazon's "chief lobbyist," Mr Trump has said on Twitter, without presenting evidence. Mr Trump called Mr Bezos "Jeff Bozo" in a tweet last month about the National Enquirer's coverage of his divorce. "It’s unavoidable that certain powerful people who experience Washington Post news coverage will wrongly conclude I am their enemy," Mr Bezos wrote. In his blog, Mr Bezos cited an email from AMI deputy general counsel, Jon Fine, to a lawyer representing Mr de Becker. In it, AMI proposed a public acknowledgment from Mr Bezos and Mr de Becker that "they have no knowledge or basis for suggesting that (AMI's) coverage was politically motivated or influenced by political forces." In return for such an acknowledgement, according to the email, AMI offered "not to publish, distribute, share, ordescribe unpublished texts and photos." Mr Bezos said the statement AMI was proposing was false and described the offer as an "extortionate proposal." Mr Fine and Mr de Becker could not immediately be reached for comment. The payment was made during the 2016 presidential election to influence that election, according to the United States Attorney's Office for the Southern District of New York (SDNY). The deal not to prosecute was conditional on AMI not committing another crime, the office said. Mr Bezos, who owns more than $120bn in Amazon stock, said in his blog: "If in my position I can’t stand up to this kind of extortion, how many people can?"